Retractable handle for rolling through crowded spaces without effort. Solid Neoprene wheels made of high quality materials built to last. Secure zipper pocket on end for valuable items. 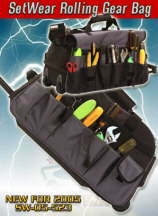 Multiple tiered pockets on outside and inside for tools and much more. One piece flap on outside pockets to help secure valuables. Padded inside on bottom to help protect tools and more. Tough carrying handles along with a shoulder strap. Size is 22" long X 12" high X 10" wide and lightweight 6X3D Nylon.